Heat oven to 400°F. In small bowl, mix bread crumbs and milk. Let stand 10 minutes. Squeeze bread crumbs gently to remove excess liquid. In large bowl, place soaked bread crumbs, beef, pork, cheese, onion and parsley. In small bowl, mix egg, garlic, salt and pepper. Add to meat mixture. Using hands, gently mix ingredients until well blended (do not overmix). Shape mixture into 28 meatballs. Place in 17x12-inch half-sheet pan. Bake 20 minutes or until no longer pink. Spray 3 1/2- to 4-quart slow cooker with cooking spray. Use a slotted spoon to transfer meatballs from pan to slow cooker. 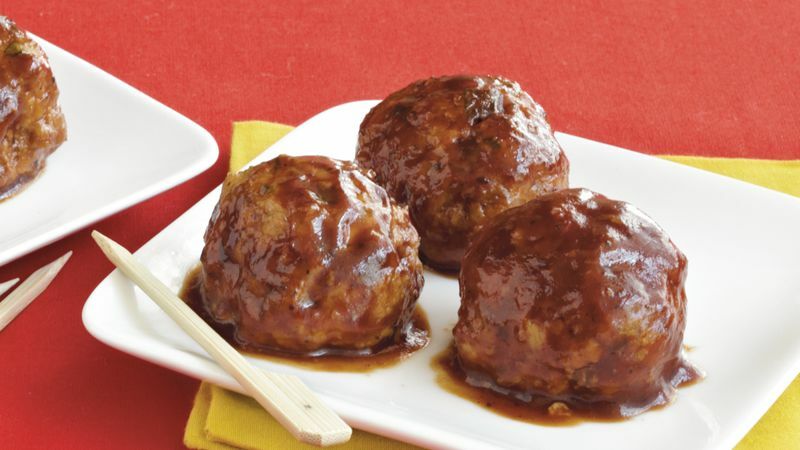 Pour barbecue sauce over meatballs; stir to coat. Cover; cook on Low heat setting 3 hours. Serve meatballs with cocktail forks or toothpicks. Meatballs can be held on Low heat setting up to 2 hours; stir occasionally.